One of the a few artists working today in the mezzotint printmaking technique Cleo Wilkinson graduated with first class honours degree from Elam Art School (Auckland University) New Zealand .She has continued with further workshops at Oxford University - Ruskin School of Drawing and Fine Art ,UK, New York Academy of Fine Art NYC, the Art Students League of New York, Grand Central Academy of Art , NYC USA , Barcelona Atelier of Realist Art , Spain and Graduate Diploma in Library and Information Science (Australia). 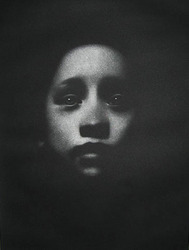 A recipient of over 50 major international and national print awards her work is also included in over 90 internationally significant major collections, galleries and museums world wide including the Victoria and Albert Museum (London) and Machida City Museum of Graphic Arts (Tokyo) and exhibited at the National Museum of China in Beijing . 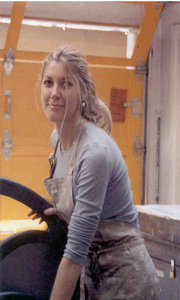 Her work has been included in over 300 International Print Exhibitions and Competitions throughout UK,Europe, Asia , Australia/Oceania, North America, South America .Cleo is regularly invited to judge international printmaking competitions. Solo exhibitions include : New York (USA), Bulgaria (Sofia, Kazanlak),Argentina (Sante Fe & Buenos Aires), Venice (Italy), Vancouver (Canada) ,Serbia (Aleksinac ,Vranje & Bela Planka), Australia (Melbourne ), Spain (Barcelona) . Cleo has worked in over 30 international locations as an invited Artist in Residence including Studios in Cuba (Havana), Spain (Barcelona), British School at Rome (Italy), Florence, Venice, Perugia (Italy), The Netherlands, Japan, Luxembourg, Greece, Sweden, Finland, New Zealand, Vancouver, Calgary (Banff), Quebec (Canada), New York, Berkeley (USA), Buenos Aires (Argentina), Reykjavik (Iceland) , Berlin (Germany) , China (Shenzhen ),Singapore Tyler Print Institute , and Oxford (UK). Cleo has taken this complex delicate and most physically demanding of all art forms to great heights and diversity. Each image shows a great range of tonal depth which is only obtained through painstaking burnishing of the plate and many trial printings. She has also designed a unique handcrafted roulette to grind the plate which creates a rare stippled texture to the images. Represented by: Davidson Galleries, Seattle USA, Old Print Shop, NYC USA, Old Print Gallery, Washington DC USA and New Grounds Gallery , New Mexico USA .Galleri Heike Arndt , Berlin (Germany) and Denmark. it is not widely used today. as “too difficult” for example by the great printmaker MC Escher. the plate holds no ink where it is smooth). infinite range of tonal subtlety. hours before even starting to print the image. Site All Images and content copyright Cleo Wilkinson . All rights Reserved.